Sniper-Tactical Squad is a Free Shooting Game For Windows 8 and 8.1 computers. You are a member of your country’s tactical squad team, and you have been offered a responsibility to take down hostile and notorious terrorists. You mission takes you to places where the targets may be located. You have to be extremely careful in this shooting game for Windows 8, as you will be operating in public areas. Do not kill any civilians. For each kill, you will be rewarded money. So go out there, and get the targets asap. This 3.61 MB shooting game for Windows 8 has been released by Midway Studios. With such small size, this game will surprise you with what it has to offer. Go to the Windows App Store to download this game on your computer. The direct link to this game can be found at end of this article. 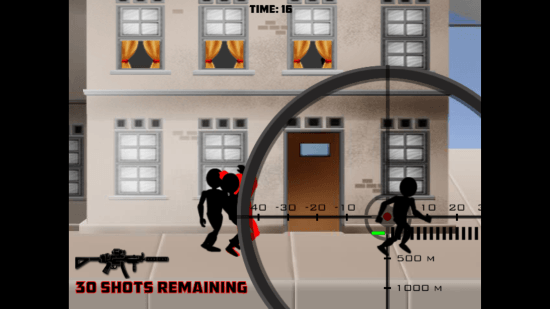 All you need is your mouse to play this shooting game for Windows 8. As you start this game, you will have to select a map to play. As soon as you click on a map, another page will open which will brief you on your mission. Now this mission brief displays the target attributes, along with your objective. At the bottom left corner, view the time limit, and the reward offered. 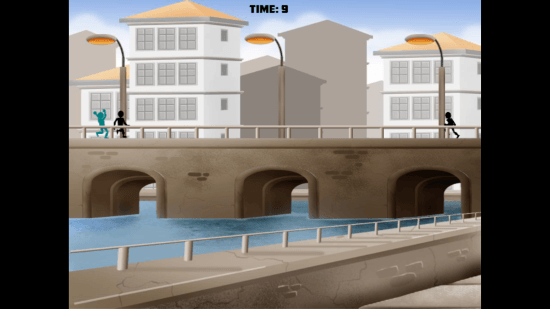 Click on Start Mission to begin this shooting game for Windows 8. The map opens like the above picture. You will have to locate your target as it will look distinct. As soon as you have an eye on the terrorist, left click on the screen to enable the Sniper zoom. Scope the target, and shoot it down. Be aware of the bullet counts. 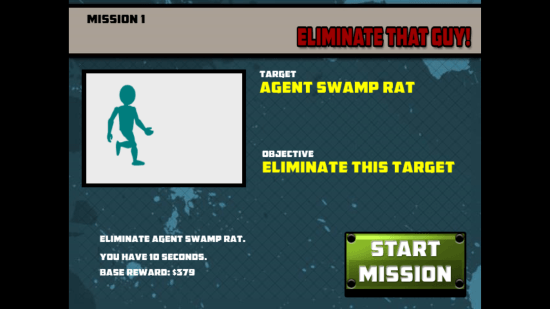 As you clear a mission, a screen with reward points appear. 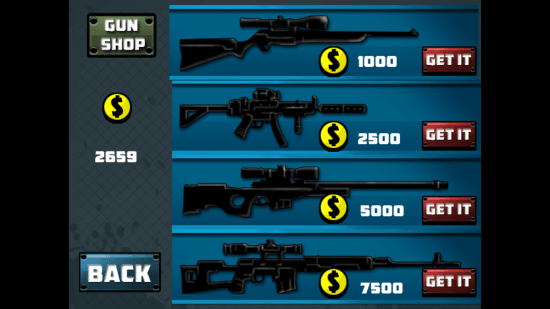 The rewards will increase as you keep playing this shooting game for Windows 8. 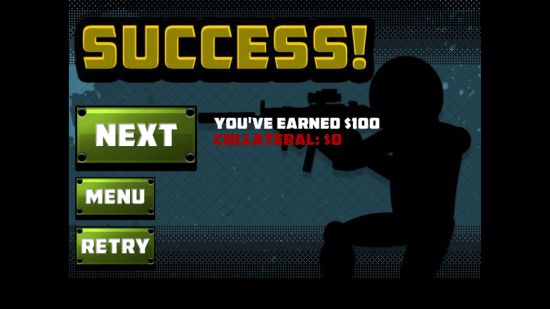 Click on Next to try a new mission on another level, or click on Retry, to play the same level again. 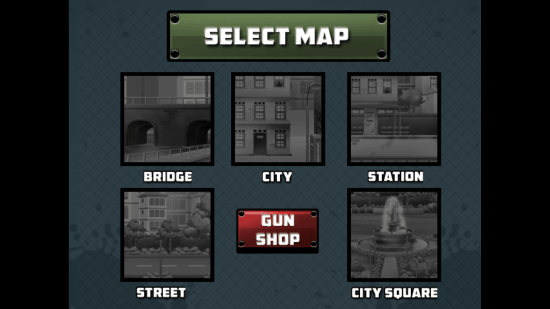 Click on the Shop option on the main menu to visit the gun shop. High range guns can be bought at the store by the money you collected with the kills. Click on GET IT if you have sufficient funds. The above picture displays the scope of the upgraded gun. It has more bullets, and is more stable and accurate. Upgrade the guns to win more money. 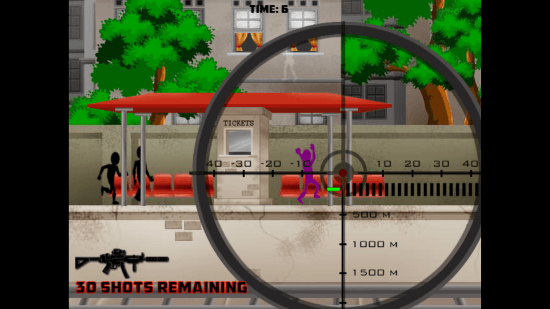 This shooting game for Windows 8 lets you sharpen your shooting skills. You will definitely love this game if you like shooting games. Download Sniper-Tactical Squad for Windows 8 and 8.1 computers today.